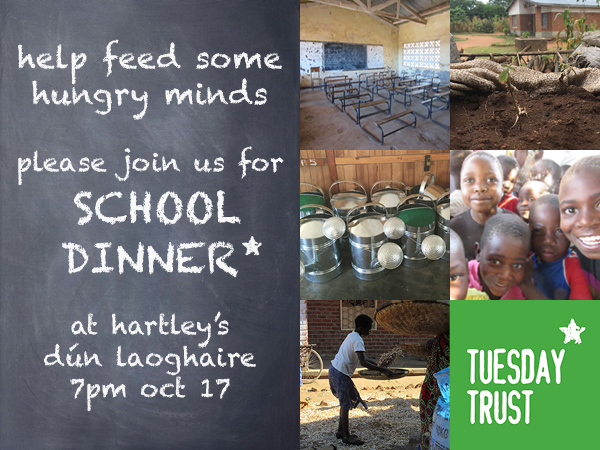 The Tuesday Trust is holding its almost annual fundraising night in Hartley’s in Dún Laoghaire on Wednesday, Oct 17 with our School Dinner. We’re raising money to support our food growing and self-sustenance initiatives in Malawi, in particular our Schools Growing programme. It teaches children how to grow their own food, supports vegetable growing gardens in their schools, with a competition to add some fun to what is virtually a life and death struggle for many. It’s hard to learn when you’re starving. So we hope to keep kids in education longer, particularly girls who are more inclined to have their schooling curtailed. Please email us here if you’d like to feed some hungry minds. And have some fun while you’re doing it or to get involved in any way. Many thanks. This entry was posted on Friday, August 10th, 2018 at and is filed under General. You can follow any responses to this entry through the RSS 2.0 feed.